I would like to start this Newsletter with an attempt to clarify terminology, and Ley Lines is a good one to start with, judging from your replies. Further dowsing terms will be dealt with in subsequent Newsletters. According to Watkins (The Old Straight Track, pub. 1925), a ley line is a physical alignment of several ancient sites1. 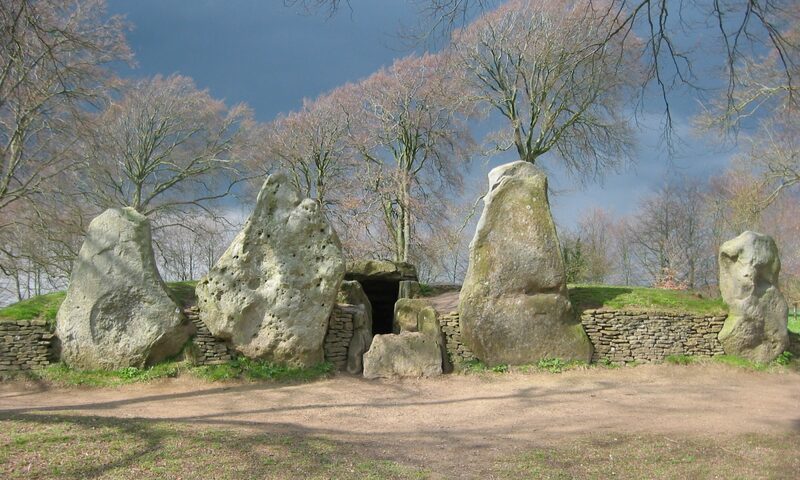 By ‘ancient’ is meant tracks, underground chambers/dolmens/cromlechs, cursuses, henges, mounds/barrows/tumuli/cairns/tumps, megaliths, Roman settlements, ancient castles, churches/cathedrals of ancient foundation, ‘mark stones’, ‘mark trees’, beacon points, moats, holy wells, cross roads, etc.2. How straight is a straight line? All sites to within a pencil width? – over what distance? Just how old is ‘ancient’ anyway? Some modern features such as lighthouses could be included, as Trinity House took earth energies into consideration when siting many of them. The important point to notice is the word ‘physical’. Now the Oxford English Dictionary describes a ley (or lay) as ‘fallow or unploughed land’ (Word first used before 15th century). Thus a ‘ley’ describes a physical feature. Towards the end of his life, Watkins stopped using this word – does anyone know why? (b) We don’t always dowse straight lines. I therefore propose that we come up with a new word or phrase.Dowsable energy line’ is a bit of a mouthful. For me, ‘ABC energy’, or ‘ABC dowsing reaction’ may be a suitable description, ABC denoting one or more types of energies. For example, ABC could denote man made/natural, earth origin/outside earth origin, etc. as in the previous Newsletter. A classification list would need to be drawn up for these criteria to describe all the energies we are aware of at present. Now it’s over to you. Please send in your comments/classifications to me by 1st of July, and I will publish your suggestions in the next newsletter. Let’s come up with some good, sensible ones! Why not dowse your own classifications? This classification may also help with healing and understanding geopathic stress, as it may be found that energies giving rise to geopathic stress may be of the ACF type, for example. Incidentally, if you find after dowsing that an ABC energy does follow a (physical) ley line, then this would be a separate and useful piece of information.